› Who needs a booking engine? Who needs a booking engine? It is a month now since we introduced Web Bookings, our own booking engine, and, from the feedback we have received so far, I feel that I need to answer some very fundamental questions the lodging owners seem to have. 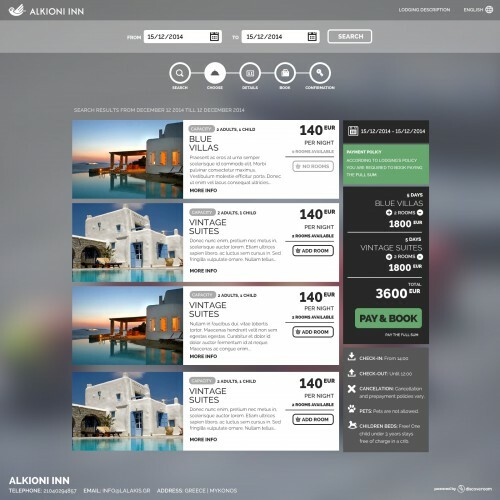 What is a booking engine? … an application which helps the travel and tourism industry support reservation through the Internet. It helps consumers to book flights, hotels, holiday packages, insurance and other services online. This is a much needed application for the aviation industry as it has become one of the fastest growing sales channels. In plain words, it is a program, a piece of software, that the lodging owners equip their websites with, in order to allow their customers to query room availabilities and make reservations from their website. And although this might be broadly understood, there are mixed opinions as to why it is needed. Let’s look at the most often quoted arguments, one by one. Lodging owners show a preference to talk with their customers versus any other kind of engagement. And this is very understandable. No software can handle client requests or arguments better than the lodging owner. Plus, the owners have the opportunity to up-sell or cross-sell more effectively. internet savvy users, mostly young, have a strong preference to book online versus by phone. This is a demographic accustomed to the speed of the internet. A phone call or a bank transfer feel terribly slow to them and they will pass it by, when they can. A booking engine would be their booking way of choice just because it has all the internet characteristics they are so used to enjoy: speed, immediacy, getting things done quickly. foreign customers that do not speak the languages the owner speaks, or that do not want to engage in costly remote calls. Your website might be translated in 5 languages, and enticing enough to attract people from these language groups, but very rarely the owner speaks as many languages as your website advertises. A phone call from such a potential client will not result in a booking easily. If you are wondering why people visiting your lodging, are only from certain geographies, this might be the reason. It is all too common for lodging websites, to have a web form that the interested visitors can use to query availabilities. And all too old. It is the way things used to work in the ’90’s. And it is not practical, at all. Remember, the person who is visiting your site, has also visited the sites of the major Online Travel Agents and your competitors before. Deciding where to stay on a trip, is a time-consuming and stressful process for the travellers. They, most often, opt for the safest and fastest solution. This means, they opt for the OTA’s, or your competitor, who offer them the chance for a direct booking from the website. Emails are not in vogue anymore. The personal and professional mailboxes of all of us are flooded with messages that we rarely have the time, the interest or the strength to deal with. Directing your customers to a communications medium that is stressful for them, does not help you close the booking. This is good. At least you are providing your clients with the means for an instant booking. And you will reap some benefits. But can you build a loyal clientele this way? Your customers will understand that you prefer not to be bothered and, in the future, they will turn to the OTA instead. And, as long they book through the OTA, it is fine. But will they book your lodging? In the OTA website, they have hundreds of different options. When in your website their attention is all yours, there are no distractions. If the customer feels attracted, you should be able to tap to her impulse and let her do a booking immediately. And, after a stay that satisfied her, even if the same customer does never return, she can refer your website to her friends and family. Again, this is fine. Provided you are fully booked most of the time. If not, then you should question yourself how many people that found your lodging through an OTA, preferred to pass by, just because you were not high enough in the results, or because a competitor had an offer that stole them from you. Advertising your lodging through OTA’s is a must in today’s complex landscape. But sacrificing all the opportunities you might have for direct bookings, cannot be a wise move by any aspect and not only because a direct booking will cost you less. In conclusion, there is no single way that a lodging should employ for allowing its customers to book. A weighted mix works best most of the time. And it works to your favour if you give customers flexibility and convenience. And this is precisely what a booking engine does.